According to the American Parkinson Disease Association (ADPA), yoga therapy has been shown to visibly reduce tremors and improve the steadiness of an individual's gait. Yoga is one of the most beneficial complementary therapies for Parkinson’s disease (PD), helping to increase flexibility; improve posture; loosen tight, painful muscles; build (or rebuild) confidence; and, through these benefits, enhance quality of life. Parkinson's disease affects the way a person moves. Symptoms begin when a person experiences a “problem” with certain nerve cells in the brain called the basal ganglia and the substantia nigra. Normally, these nerve cells make an important chemical called dopamine. Dopamine sends signals to the part of your brain that controls movement, the primary motor cortex, or M1. While the disease chiefly affects middle-aged and elderly individuals, it can be diagnosed much earlier, as in the much-reported case of actor Michael J. Fox. A tremor, or shaking, usually begins in a limb, often in the individual's hand(s) or finger(s). In the research and testing of Parkinson’s treatments, alternative and complementary medicine are of great interest in the medical community. While nutritional changes have not been shown to slow the progress of the disease, an overall better diet and lifestyle help mood and desire to keep active. The use of movement, sound, and especially music appear to be beneficial in improving motor, affective, and behavioral functions. With this proven connection in mind, the inclusion of yoga’s sound, breath, and rhythm practices in a sequence may help individuals with Parkinson's disease experience movement with a greater sense of ease. What types of yoga practice are most beneficial for PD? Seated and assisted postures may be more accessible for those with limited mobility and/or any feelings of unsteadiness. Practices that involve sound (chanting, playing, listening, and moving to music, singing, drumming, and kirtan). Music therapies can be effective in gait training by providing a steady rhythm for gait and stride. Simple rhythmic movements around a room, or shifting from one foot to the other and alternating arm swings while sitting in a chair are staples of PD yoga classes. Movement with music has also been shown to improve endurance, range of motion, strength, and hand coordination. These effects are enhanced when the movements cross the midline of the body (think eagle arms or self-hugging, touching opposite ear, or crossing hand to opposite knee in a seated twist) due to the brain hemisphere coordination required in these actions. Rhythm awareness (working with breath ratio, moving to the rhythm of the breath, orkriyas (yoga actions with specific intention, usually performed to repetitively prescribed tempos). This might include alternate nostril breathing with a 3:3:3 ratio (inhale 3, hold 3, exhale 3) or moving the arms up for a count of four, out for a count of four, and down for a count of four. Movements that can be done on the floor or in bed to help with morning stiffness. Lateral stretches (reaching through each side, like reclining crescent) and gentle hamstring warm-ups (like apanasana, knees-to-chest pose, to supta padangusthasana, supine hand-to-big-toe pose) are great ways to begin the day. Variations and modifications to ensure comfort and safety. 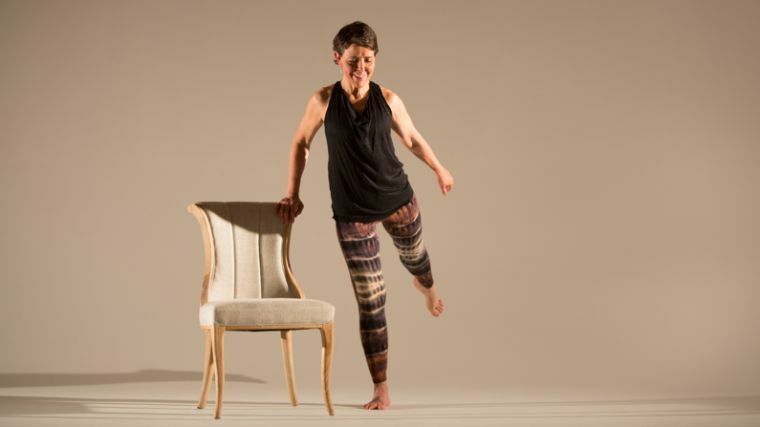 The use of a wall or chair for stabilization or yoga props that cushion stiffer areas of the body are often welcome additions. For instance, since balance may be a common challenge among individuals with PD, be prepared to use a wall or offer modifications that allow the practitioner to stay lower to the ground. Asanas that strengthen core and posture, like utkatasana (chair pose), modified navasana (boat pose), or variations of salabhasana (locust), to aid in countering the rounding shoulders and forward head that often accompany PD. After working in clinical, hospital-based, and private settings with clients in various stages of PD, I’ve found that it's best to keep sessions fun and mobile. While we teachers want to be careful to avoid injury in these sessions, a practice tempo that is too slow can be irritating for students. People with PD have enough stress on their plates without adding long holds or frustrating alignment cues. Starting with dynamic movement is especially helpful for tight muscles (a common symptom of PD) because these movements are warming and help the loosening process. Music at intervals in class, for warm-ups or standing postures, may help relieve stress, and there is a strong connection between experiencing music and dopamine levels which are adversely affected by PD. Nature sounds or music may also be helpful for relaxation, as may the incorporation of chanting for improvement of breath and posture. If a teacher decides to utilize chanting as a vocalizing therapy, they should first consider whether or not it's likely to seem unfamiliar or awkward to students. They might want to first introduce vocalizing with an ah sound or even a-e-i-o-u as this also helps with keeping facial muscles coordinated. 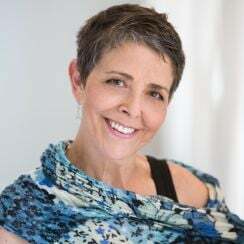 There are many levels and stages of PD, and symptoms often vary from day to day.An instructor's ability to change plans or offer thoughtful modifications is an important part of PD yoga therapy. It's also important for teachers to speak confidently and clearly, and to maintain a light-hearted attitude as this can help to put students at ease. Below is a template for a one-hour practice for individuals with Parkinson’s disease. 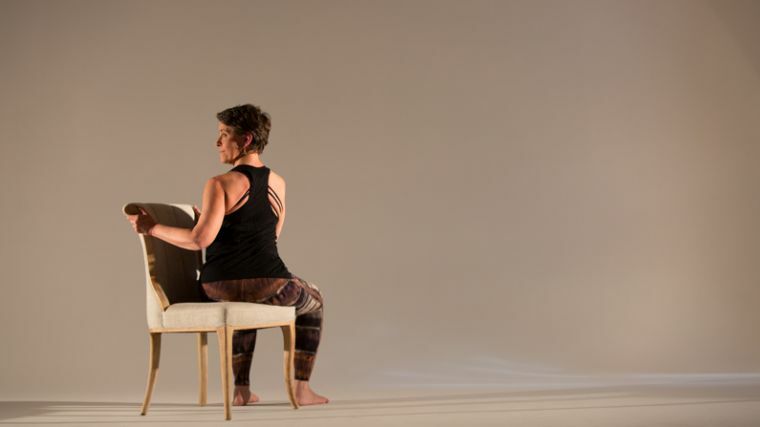 Begin sitting in a chair; draw your attention to your posture and the rhythm of your breath. Allow your breath to expand in a calm way, over the course of three to four minutes. Chant Om or a-e-i-o-u three times. Place your hands on your knees and inhale as your chest and abdomen move forward; exhale as you dome the spine and contract the belly area. Continue to alternate for two to three minutes. Inhale center and exhale as you revolve your chest to each side. Continue until the strong muscles in the sides of your waist feel warm and awake. Release one hand down and extend your top arm as you turn your face down toward the lower shoulder, taking three long, deep breaths. Make sure you come up to center slowly, on an inhalation. Repeat on the other side. Interlace your fingers behind your head, pressing your head lightly into your hands; “paddle” your elbows forward and back, one at a time, as though you are kayaking and your elbows are your oars, enjoying a deep side-body opening and smoother mobility in the shoulders as you move. From a stable standing position or seated in a chair, lightly sniff in (about one-third of your inhale capacity) as you sweep your arms upward and cross at your wrists. Then sniff in again, reaching about two-thirds of your inhale capacity as you swing your arms down then out wide like an orchestra conductor. Then sniff in again, to your capacity, as you swing arms back to the crossed wrist position. Exhale (through your mouth or your nose)* as you sweep your arms down and back past your sides, bend your knees, and slightly bend forward. Repeat five or more times, using the momentum of each movement to take you to the next, and feel how the swinging starts to become natural and invigorating. *Sometimes exhaling through the mouth, as in the classic version of this kriya, can cause a bit of dizziness. Try exhaling through the nose for a more stable version. If you are standing, you will swing one leg forward and back, catching and then holding under the knee for three breaths. Use a support if needed for balance. Do three rounds on each side. If you are sitting in a chair, try apanasana, alternate squeezing knees into the abdomen on an exhalation. Repeat three times. 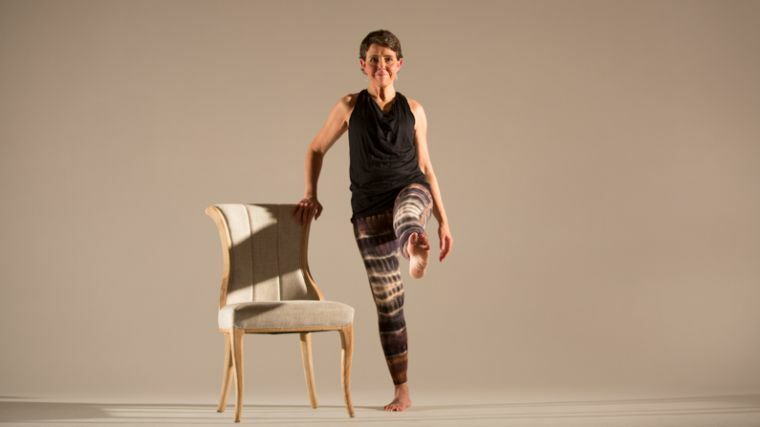 Use a chair to support your lower body in warrior I pose (support your front thigh on an angled chair seat). Start with your right leg forward. On an exhale, move your arms from traditional warrior I position into prayer, then rotate your chest to the left. Inhale, and expand your arms wide to warrior II position. Exhale, drop your back hand to your calf, and then extend your right arm upward on an inhalation, coming into peaceful warrior (also known as reverse warrior). Exhale, bring your right forearm to your front thigh for ardha utthita parsvakonasana (half side angle). 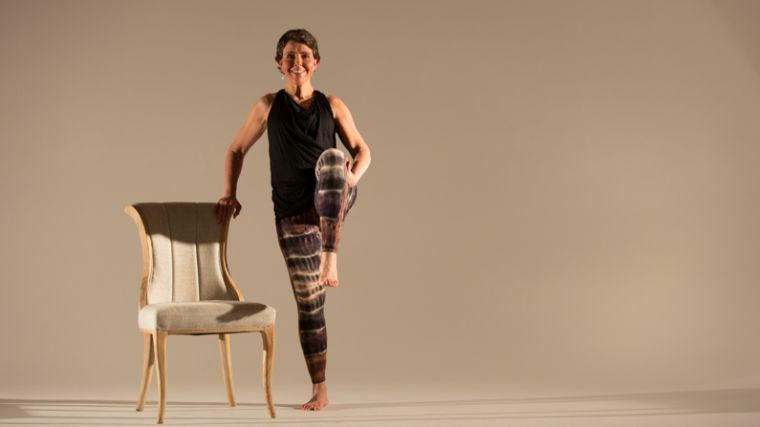 Finally, rotate your body to face forward in a chair-supported goddess pose, then repeat this flow on the second side. These wacky arm circles get easier with practice. Keeping your breaths long and deep, begin with your arms outstretched in front of you, palms together, and circle your right arm forward as your left arm circles back. Reverse directions. Now try starting with your hands on your shoulders and your elbows touching and making opposite circles with your elbows. Then just for fun, bring your arms alongside your torso and try rolling your shoulders in opposite directions. If you didn’t get it today, hopefully you got a good laugh from trying! Sitting to the front edge of your chair, bring your hands to the sides of the chair seat and inhale, inflating your chest and arching your spine to a backbend (keep the back of your neck long; avoid flinging your head back). Exhale, relax the squeeze between your shoulder blades, and return to your starting position. Do five repetitions of chair camel to the rhythm of your breath, then hold the spine arched for three breaths. You can also do a traditional kneeling camel pose if you wish. Remaining in this hip opener, you can add cat/cow movements to the spine and pelvis. Try humming or “Oming” the breath out on your exhalation and you may find your hip relaxing more easily! This version of a twist feels a little odd but has shown benefit in many neural disorders. It uses the eyes and body movement to work across the hemispheres of the brain. Take it easy and come out if you feel any dizziness. Sit very upright and sideways in your chair with your right hip toward the back of the chair. Take your hands to either side of the chair back and gently revolve into a twist, keeping your knees even. Gaze to the right and keep your eyes looking to the right as you turn your head to the left. It is common for this movement to challenge your ability to maintain a long, deep breath. It's also common for the movement to seem “jerky.” Don't be discouraged if it seems a little awkward in the beginning. Try once on each side, building to two on each side. Still in your tall seated posture and lower your chin down toward your chest. Inhale here. As you exhale, stick out your tongue and gaze upward. Repeat this three times before bringing your head back to a neutral position. Rest your forehead on a table or bolster. Stay here for 10 deep breaths. Savasana in bed or on the floor for 10 to 20 minutes. If you're practicing with a chair, you may also choose to remain seated. You might choose to continue your forward fold for a longer period of time; just make sure you are comfortably supported. Start with a 1:1 ratio breath (meaning your inhalation and exhalation are the same length), relaxing your abdomen on the inhalation, with minimal pause between breaths. Gradually move to a 2:1 breath, with the exhalation lengthening to twice the length of the inhalation. Continue until your body feels very calm and relaxed. After the deep rest is a good time for breath practices that create a pleasant healing vibration in the brain. Humming in bhramari or “bumblebee breath” can lead us into a more meditative state and is known to help with memory. Start with a low pitch humming the breath out for three breaths. Mid-range next and then high like the buzz of a mosquito. Try relaxing your tongue or varying the vibration with an “ing” sound (like in the word “sing”).